Looking for a reliable, affordable, & secure on-site paper shredding service? 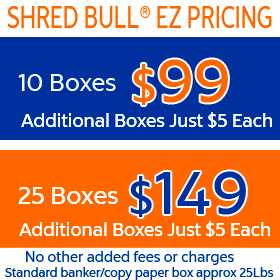 Shred Bull Orange County Paper Shredding makes it easy for you to find our pricing and services. Our mobile paper shredding company performs document destruction at your site. Mobile paper shredding is the most convenient way to destroy documents. The paper shredding truck arrives at your location, and our staff will gather all of your documents and shred them for you. Mobile, on-site paper shredding is the easiest way to take care of your document shredding needs. Pricing is not the only consideration you have, but let’s face it, once you watch a big mobile shredding truck shred your documents you’ll understand how difficult/impossible it would be for anyone to put all those pieces of shredded paper back together. Our Orange County Document Shredding truck holds tons of shredded material…that would make for a huge puzzle. Once we shred your documents, they never leave our control…ensuring a proper chain of custody. We are 100% compliant with all privacy legislation as well. Bottom line is, we are small and efficient allowing us to beat the big guys prices. Here is our business and residential shredding services pricing, call us if you have any questions. 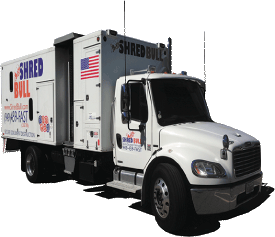 Shred Bull Paper Shredding Truck arrives at your Orange County location. Shred Bull Paper Shredding staff gathers documents to be shredded. Shred Bull Paper Shredding scheduled Orange County route service is our most popular option. The route service is a perfect shredding solution for any business that has an ongoing need for document shredding services. The route service utilizes our office consoles or the wheeled shred carts. We will work with you to determine how many consoles or shredding carts your business will need. This need is primarily based on the volume of paper that is generated each week. One of our office consoles will hold 90 lbs, or about 2 bankers boxes of paper to be destroyed. We charge for the service call, not the console. The Consoles make great printer stands too! Shred Bull Orange County Paper Shredding also offers 95 gallon wheeled industrial shredding carts. These carts are great for warehouse environments that allow for the more utilitarian appearance. These carts are what we use for our one time purge clients. They hold 300 lbs of paper and use a padlock to keep them secured. 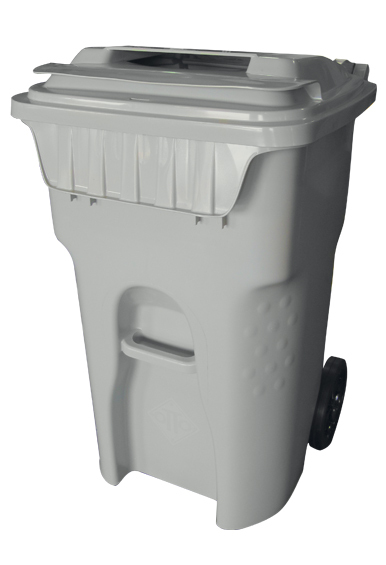 The 64 gallon wheeled shredding carts are about a third smaller and hold about 200 lbs. 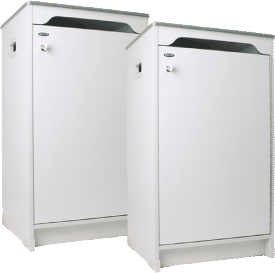 Both of these shredding carts hold a lot of paper and come with a secure, specially made lock as well. We guarantee you the best price! If you find a lower price online please bring it to our attention and we will beat it! This offer is for our scheduled service and does not include matching the other guys once only offers. Just show us their bid or URL and we will do our best to beat it, that’s our promise. Would you like to drop off and watch us shred your boxes? We offer drop off service in our Rancho Santa Margarita office for Orange County Paper Shredding clients, both residents and business shredding for companies. We will schedule a convenient time/day with you. If you have more than 10 boxes we are happy to come to you and pick them up at no extra charge. The latest Tweets from Shred Bull Shredding (@goshredbull). Awesome Orange County paper shredding service. Give us a call today–we will shred for you tomorrow! Shred Bull | LinkedIn Connect with us! Learn about working at Shred Bull. Join LinkedIn today for free. See who you know at Shred Bull, leverage your professional network, and get hired.